Elegant and ethnic at the same time - looks as if it has come from Morocco or some other exotic place. 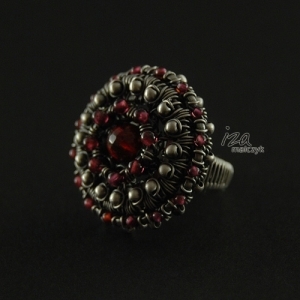 Made of sterling and fine silver and 3 sizes of garnet rounds. Oxidised and given a mat finish. The circle is 2.5cm in diameter.